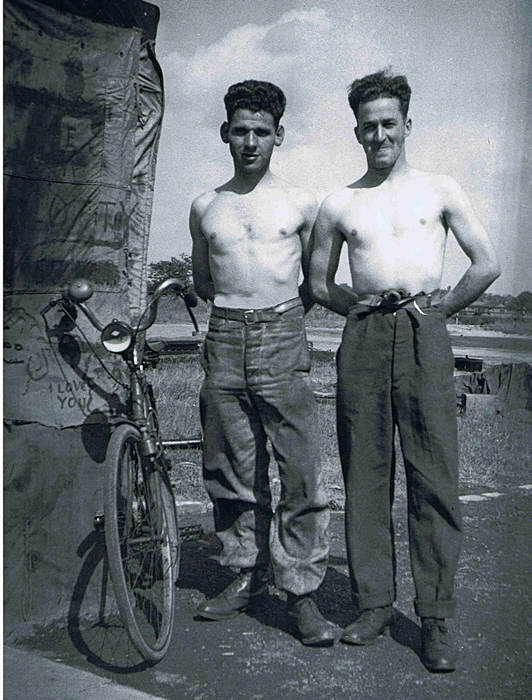 For Jack Harris, also known to friends or those around him as Jock or sometimes Scotty, his first taste of the RCAF would be at one of the many Manning Depots setup across the country. These Depots, bases or camps could also be used to describe them, took the civilian out of the recruits and introduced them to the military way of doing things. For his trade Harris selected, aero-engine mechanic, one of many technical trades offered by the RCAF. After a series of tests to confirm his abilities in this field he was posted to No.1 Technical School. Located at the grounds of the former Psychiatric Hospital , in St. Thomas Ontario, it would soon become a huge center for not only aero-mechanic recruits, but also electrical, airframe riggers, instrument repairs. As the aircraft and equipment became more complex, the base was expanded and expanded, soon 2,000 trainees at a time were involved in some level of the six month courses. Once Harris received his LAC Prop (Leading Aircraft Craftman) a sign that he had completed his training and passed the tests set out for his trade, he was ready to work at his trade. He as would others of the new groups of LAC would be assigned to one of the flight training schools in Canada. The Elementary Flying schools (EFTS), and Service Flight Training Schools (SFTS) were an additional training step that the RCAF put into place. This not only enhanced the skills learnt it would bring forth a real sense of the dangers and losses that he may face ahead once overseas. 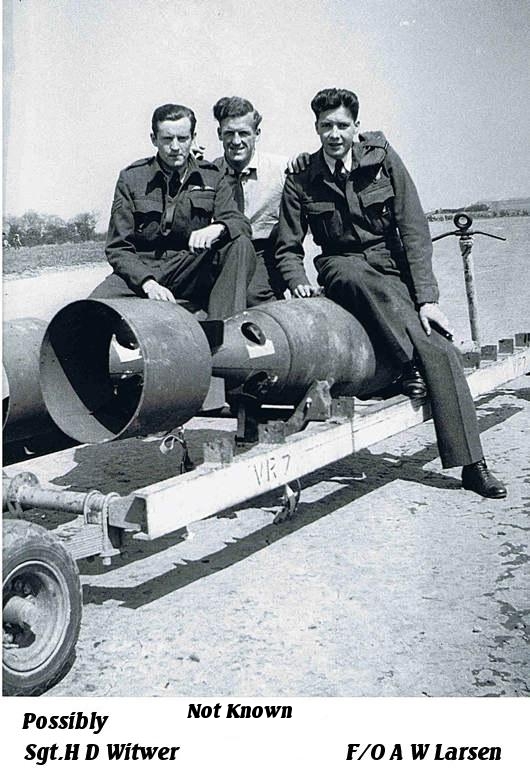 At these RCAF training bases while teaching so many to fly there were accidents some became fatal others simply a learning step were no one but the pilots pride was hurt. To the new LACs like Harris it no longer was class room engines that would never be used or endanger anyone, the engines now in Harris's hands that would be used on aircraft with crews on board. 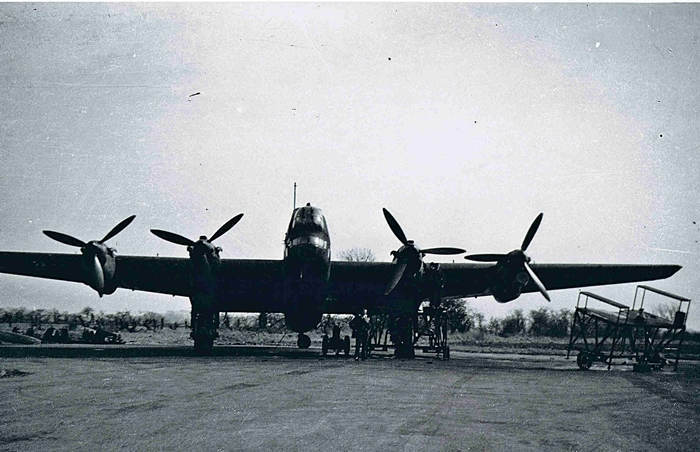 Once posted to 419 squadron, he was assigned to VR-P, serial number KB720, nicknamed "Pidlin Pete" . Here working in the best and worst elements of the British weather he maintained and repaired the four Packard built, Rolls Royce designed Merlin engines that powered the Lancaster. 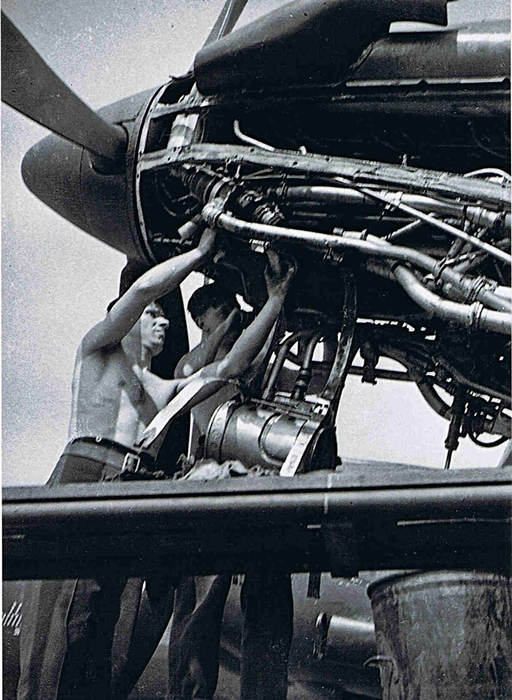 It is plain from the photos that they were young wiry men who had to be flexible and willing to climb around the wings and platforms to get at the engines high off the ground. Winter could bring cold rains or icy conditions to tend with and Harris was always in danger of falling off a wing or the portable platform used to get at the engines. The groundcrews did not work in hangers, they did all there work outside. Some dynamic engine adjustments required being near those huge spinning propellers. Accidental deaths or injuries, and illness from long hours and working outdoors were a reality.. The ground crew had no set hours, their work started and stopped as the demand of aircraft repairs required. Only quitting when aircraft repairs were complete and met the Sergeants standards, then maybe they could finish for the day. Unless they were needed by another ground crew to help them. So it is no wonder they kept slim and strong. During his time looking after KB720 ,Harris would have met a lot of different crews. RCAF air and ground crews were close and respectful of each others skills. They became close and rank did not seem to come into play when it came to working together on getting the aircraft ready and signed off for operations. For many months and over 30 operations KB720 had served faithfully to her crews, thanks in part to the ground crew but eventually Piddlin Pete was in need of major repairs and new VR-P Lancasters would take it's place. Some would come back damaged, flak holes or bullet holes in them and one would not come back at all. All these facts were things that the ground crew men faced and lived with. The loss of a crew was always felt deeply by these men. With the end of the war nearing and 419s few last operations closing off. Scotty was on his way home. He like many others had found that very special someone, and with special permission he and his bride Myra had been married on D-Day, June 6th 1944. Returning home to Hanover Ontario where he raised his daughter and son, was a piper for the Hanover Legion. Still with a Scottish accent that gave him his nick names, Jack Harris resides in the area, looked after by a loving caring family.